In New Mexico, we happened upon a hidden clearing, a grassy oasis where we stopped for lunch. Here, I collected these two cow vertebrae, marveling at the sculptural beauty of these objects. Later, we visited our daughter Gracie in Oregon where she was interning on a farm. For a time, she had possession of a sheep, Mango, in hopes of sheering her and learning to spin the wool. In Nova Scotia, we encountered many findings of sea rope, washed up from lobster traps and fisherman. 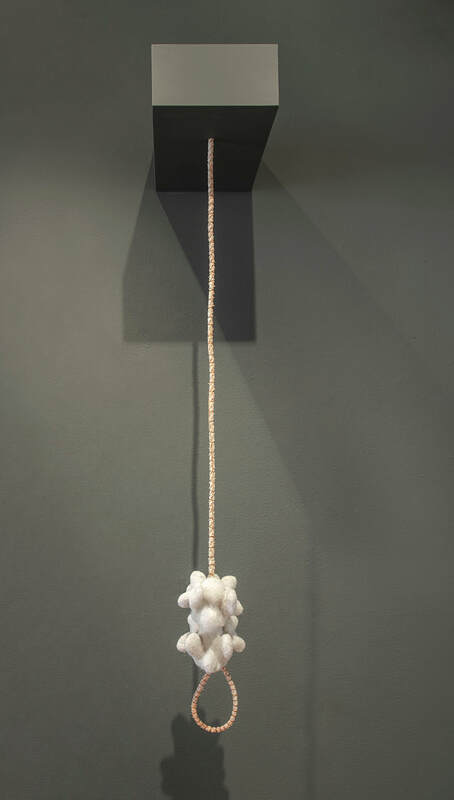 The end of this found rope has been modified, weaving the end into the twist of the rope to create a secured loop which supports these suspended vertebrae that have been needle felted with Mango’s wool. This piece “opens” our exhibition - us two, enveloped by the soft trappings of our children, and supported by this closed loop of time-weathered rope.